One thing most people can agree on is their enjoyment in classic Disney animation. It is the pinnacle of animation for most and something that has seemed to be a thing of the past at Disney. The last traditionally animated Disney feature film was 2004's Home on the Range and since then we haven't seen anything other than CGI animated features from Disney. That all changes with Disney's "The Princess and the Frog" which is slated for a December 11th 2009 release stateside. 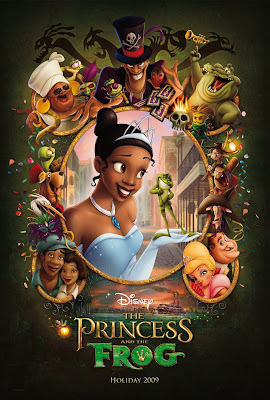 Today I have a new poster for the animated feature which features Disney's first African-American princess. I love the new poster, which gives a great look at the wide range of character in the new Disney animated film. "The Princess and the Frog" is co-directed by Ron Clements and John Musker and follows young princess who lives in the French Quarter of New Orleans in the height of the Jazz age. Hopefully "The Princess and the Frog" does well enough that Disney will continue to make feature length traditional animation and not leave it in the past for newer technology. We need to keep traditional animation alive in an industry that is over-plagued with CGI and motion-capture films. Enough of my tyrant, scroll down and check out the new poster and also I've included the US trailer for the latest Disney cartoon.